Commissioners should strive to deliver measures to address loneliness at a neighbourhood (or even ward) level as older people spend more time in, and often feel more committed to their neighbourhood. Breaking down areas at neighbourhood level can also be more manageable and allow effective targeting of initiatives and enables outreach efforts. The Neighbourhood Networks in Leeds have led the way in establishing a neighbourhood based approach to ageing issues more generally, and have gathered evidence about the impact of engagement with neighbourhood networks on feelings of connectedness and wellbeing, using the Older Person’s Outcomes Star. Watch our video on Leeds Neighbourhood Networks that delivers 37 locally based schemes, run by committees that are representative of the communities they serve. • Convening a core group of residents to identify, from the asset mapping and mobilising activities, the key theme or issue that will inspire people to get organised and to create a vision and a plan levering in outside resources only to do those things that the residents cannot do for themselves; they need to be in a position of strength in dealing with outside agencies. • Local Government Association Guidance A glass half-full: how an asset approach can improve community health and well-being. Volunteering can directly prevent and alleviate loneliness, improving wellbeing and social connections for the volunteer. Local commissioners and service provides can work in partnership with their local Council for Voluntary Service who will have links with voluntary sector groups/providers in their area, and often administer a website that enables search and self-access activities and resources. The National Council for Voluntary Organisations has a large resource pool covering all aspects of volunteering and publishes an annual report that can assist commissioners. 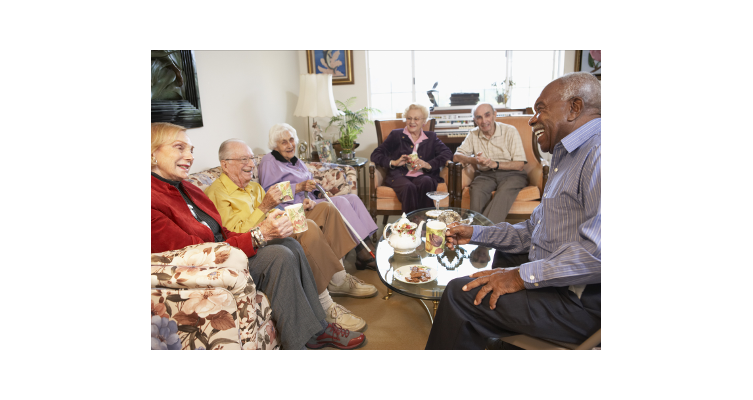 • Contact the Elderly holds tea parties for older people over 75.The tea parties are provided by hosts who can offer tea for small groups two to three times a year. The charity relies on regular volunteer drivers to take guests to the tea parties and home again. • Reach finds volunteer positions for people with specific skills. • Time Banking exchanges individuals time sharing their skills, for example in gardening for credit, which then can be used to gain the time of another individual skills, for example, setting up the internet. Age positive approaches involve local authorities placing an emphasis on healthy and active ageing in their policy and practice, and reject negative stereotypes of later life. In 2010 Manchester became the UK’s first Age Friendly City, and is part of a growing global network supported by the WHO. An age-friendly city adapts its structures and services to be accessible to, and inclusive of, older people with varying needs and capacities.